I’ve been into e-readers the past few years. I started off with the Sony Reader 505 and last year upgraded to the new Sony Reader Touch Edition 650. One of the things I liked about this model was that it had the ability to upload wallpaper and change the screensaver image. Of course, the first thing I have to do in that case is to put comic book images on the device! 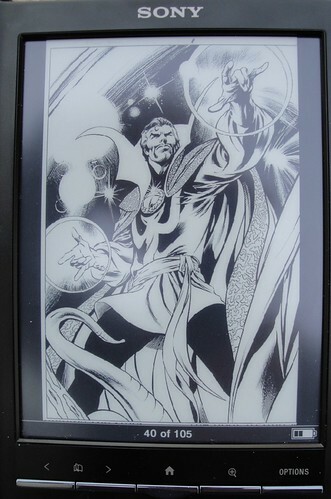 The one you see above is an Alan Davis pen/ink drawing from the Stan Lee Meets Doctor Strange special from 2006. You can see here a collection of Doctor Strange artwork by Paul Smith, Michael Golden, Frank Brunner, Barry Smith, Davis, and Gil Kane that I’ve converted to black and white images. These all look great on my pearl e-ink device, they should work fine on the Amazon Kindle as well as the Sony readers. For more comic-book themed wallpapers for Sony Reader and Kindle (both Marvel and DC Comics), check out my article on Giant-Size Geek. Nuff Said! Hey Richard, I'm posting a few superhero related albums at my blog today. Feel free to drop by and have a look around, they will all be up in about 6 hours time.